Where can you get a good breakfast in Cuzco? Almost all major hotels offer something, as do many hostels. However, what you get may be a hot drink and some bread. If you want something more, your only option is to go looking at cafes and restaurants around Cuzco. In the area of the Main Square, Cuzco’s Plaza de Armas, there are a number of places where you can get a good start on the day. The best breakfast I have ever had in Cuzco, without doubt, was at Cicciolina Bakery (Sunturwasi-Triunfo 393). In an old, colonial building, a block from the Plaza, Cicciolina is famous for providing some of the outstanding food in the city. Among other things it take pride in providing its guests with good, fresh baked bread. To be able to do so, it opened a bakery on the ground floor of the same building where it is found. Right off the patio, you enter into a small room with racks of bread and a couple of tables where the food is, without doubt, some of the tastiest you will ever have in your life. 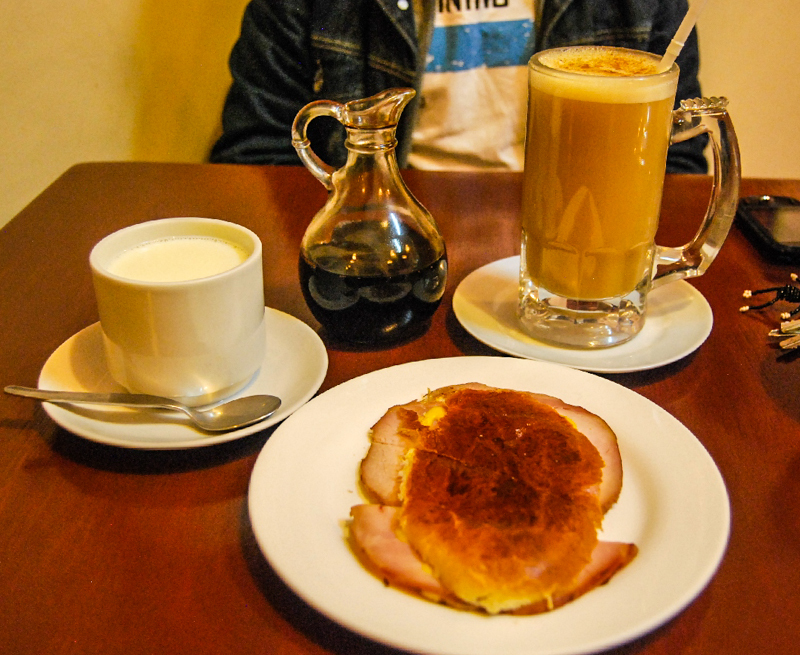 Cicciolina does not offer the famous set of Continental and American breakfasts found throughout Cuzco, but rather its own combinations and creations. They are superb. If you want something more local and less chef-ly, then you might want to stay on the Plaza and climb a flight of stairs above the Portal de Comercio, to Cappuccino Cafe (Portal de Comercio 141). They make a mean capuccino, as well as offering other coffee drinks, and hot chocolate, hot tea, etc. Besides claiming an amazing position from which to look out at the Plaza, the Cathedral and the Jesuit Church, as well as the clouds marshaling their forces above Cuzco’s hills, the Cafe serves a fruit salad, which you can have served with yogurt, muesli, and honey, that will make you wish you lived here all the time, it is so good. 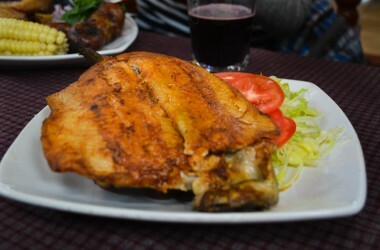 They also serve crisp and tasty bacon–a surprising rarity in Cuzco restaurants if you expect quality, as well as well-scrambled or fried eggs as you prefer them, with well made, fresh fruit juices. Say you want something more Cuzco and less international, you can walk a block down the Avenida El Sol, and half a block up Almago Street to the classic Cafe Ayllu (Almagro 133) with its murals, attentive and knowledgeable staff, and Cuzco style coffee. Cafe Ayllu, whose name means “Community Cafe” is an old Cusco standard with more than forty years in the business. In the afternoons it fills with the matrons of the city and their friends who come for an afternoon coffee and snack, called lonche in local parlance. The coffee served in Ayllu is also made in the traditional Cuzco way. The beans are roasted with orange peels and more, and then ground. From the grounds, the Cafe makes what is calle “esencia de café” or “coffee essence”, an espresso like syrup. They serve you a cup or glass of steaming water or milk into which you pour the amount of coffee you wish. 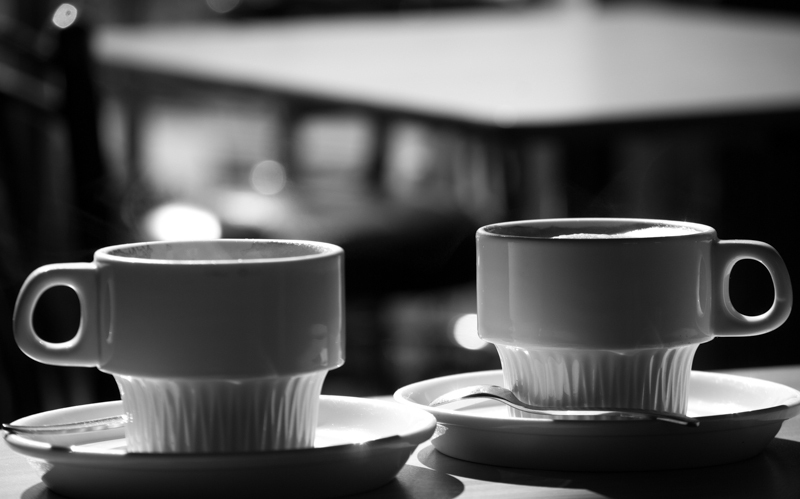 You can have a light coffee or a heavy one, according to your preferences. El Ayllu also serves traditional Cuzco pastries and sandwiches, including the very traditional pork loin, called “lomo ahumado” or smoked loin. 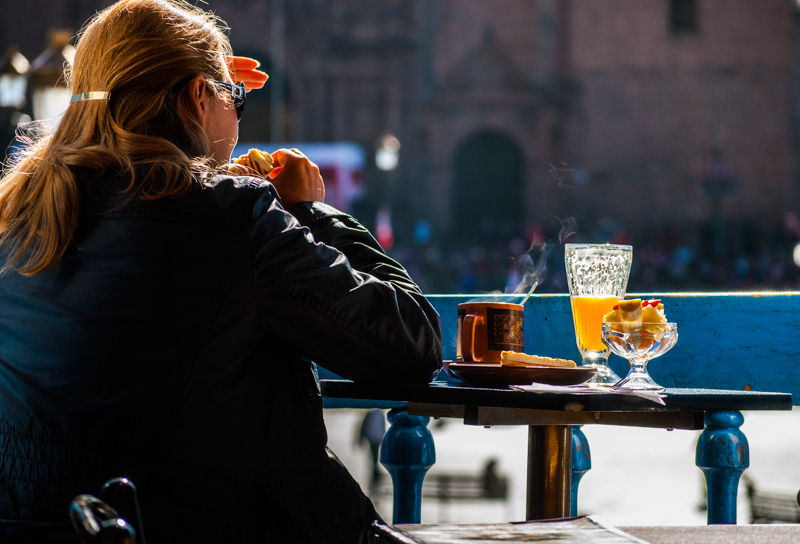 If bread and pastries are your thing, you can walk to the back side of the Plaza, where it faces the Regocijo Square, and enter the Panam Cafe (Portal Nuevo 232 ). It is small, with only a few tables downstairs, and more upstairs in its loft with colorful painted walls that make you feel as if you had moved inside a work of art. 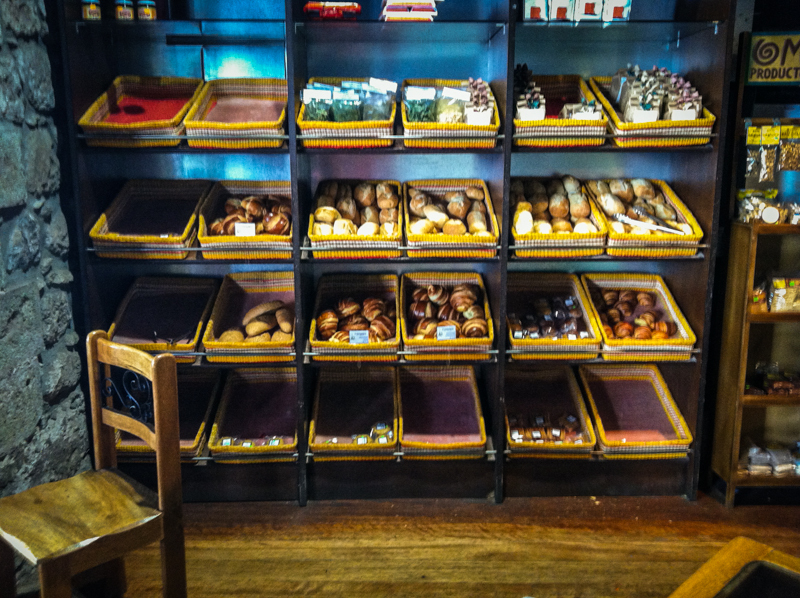 The best part of Panam is, without a doubt, their rolls and pastries. They serve good croissants, as well as ciabatta that remind you of good Italian rolls from North America. 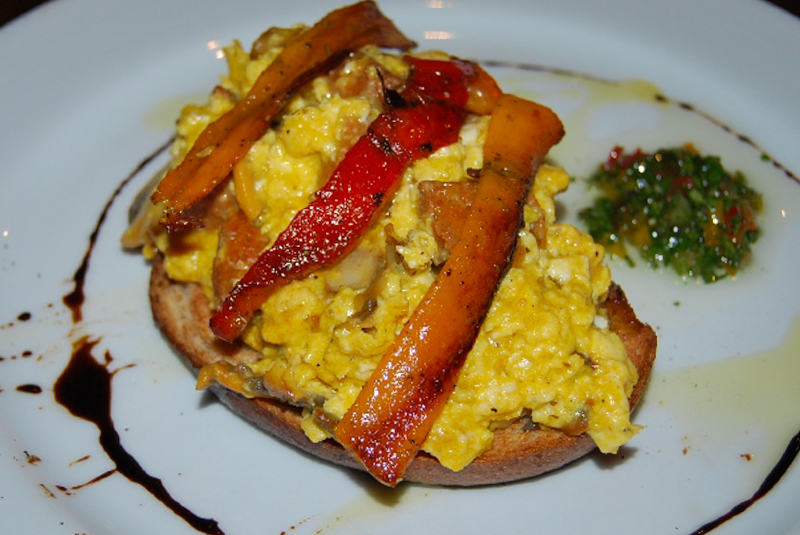 But that is not all, they also offer a range of classic breakfasts, accompanied by their pastries and breads. If you just absolutely need to have crisp, Belgian-style waffles covered with fruit and whipped cream, or pancakes like home, then you have to climb up the hill from the plaza, some three blocks, to the San Blas Plaza. Once there, look past the colonial Church and across the plaza itself to a row of buildings where you will see a wrought iron sign that says “The Meeting Place” (Plazoleta San Blas 630). 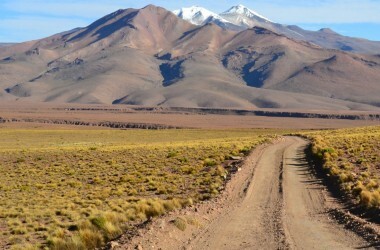 Owned by American expats, who also are into the motorcycle tour business, The Meeting Place is run by volunteers, generally from English speaking countries. Although somedays it seems like everyone speaks English, this is a place where you can hear the genuine thing, from native speakers. The coffee, although using beans from Cuzco’s Coffee growing regions, is American. It is filtered coffee, something very difficult to find in Cuzco. 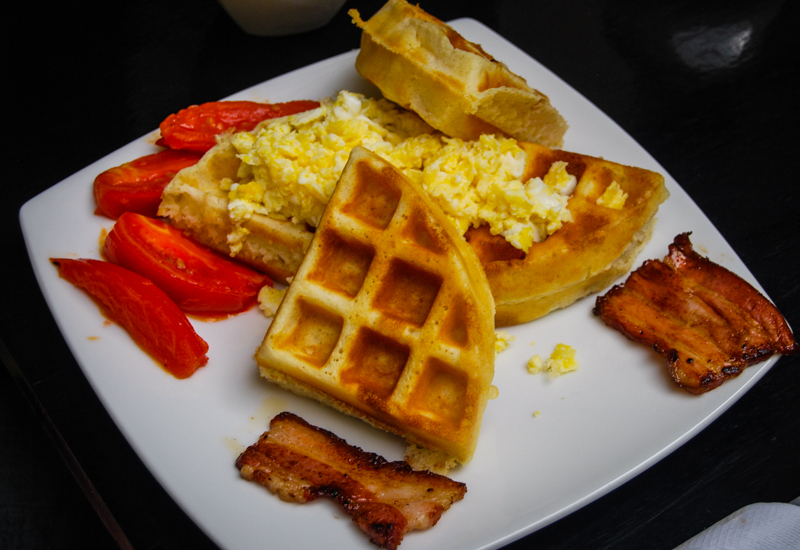 To make waffles, they brought waffle irons from the US and worked the recipe for high altitude to produce light and crisp delights, such as you would have in the United States. This place is so American, that if you wish, you will come back for the American style hamburgers that are a world away from the mass market McDonalds, and more like a home barbecue. Whether you want food that makes you feel like you are in the United States, something genuinely Cuzco, an international offering with barista coffee that is a world better than Starbucks, or a well thought out and amazing culinary concoction, one of these places is for you. 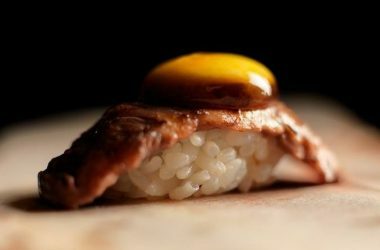 The city holds with many other fine dining options, but you cannot go wrong with one of these. They will start your day with a smile of contentment and give you the energy to take full advantage of Cuzco’s offerings. I’m sorry, but how could you leave Jack’s café off this list? Whether it’s breakfast or lunch, the food is so good, there is usually a small and fast moving queue to eat here! The French toast is the best I’ve eaten anywhere in the world and their large cooked breakfast is amazing, as are the fresh juices and coffees. Owned by an Australian woman and staffed by friendly and well polished locals who speak Spanish and English fluently. Don’t miss it!